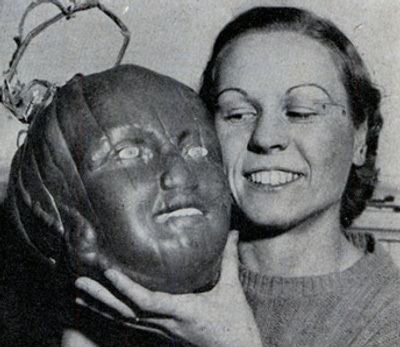 Lisa Katayama from Boing Boing had an interesting post pointing to the January 1938 issue of Popular Science where they spotlight an Ohio farmer who used a metal mold to form this surreal image of a face onto a pumpkin. Ohio farmers really were ahead of their time when it came to thinking outside of the box. Richard Twedell is the president of Vegiforms, a company in Ohio that offers a few different plastic molds that might tickle your fancy and satisfy your vegetable sculpting urges. He claims his heart shaped zucchinis sell for 3 bucks to a local restaurant, which could add up to some real money if it caught on as some sort of new holiday trend.